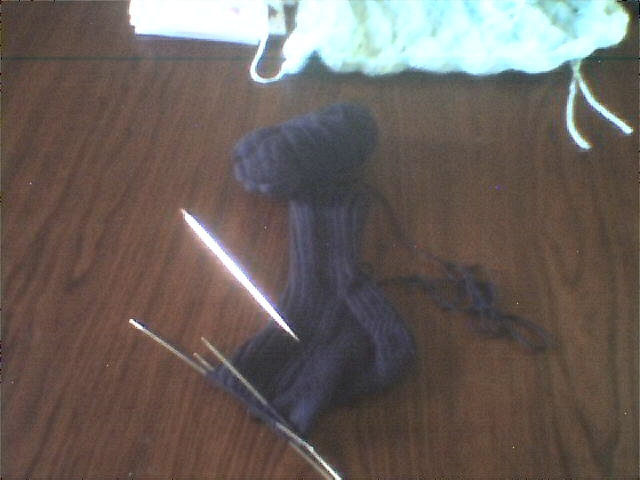 ok, DH’s socks are nearly done (emphasis on nearly – his bday is tomorrow) and my RA is acting up – good timing ughhhh. I have to say that I LOVE the Knit Picks Essential but I am not even remotely in love with working dark navy blue. It’s hard to see what I’m doing with it, gussets have to be done in full day light with the lights on in the front room and I’m not that blind lol. I like the way Essentials feels, and will definitely be using it quite a bit in the future – lighter colors though. It does have a tendency to split a little so having to be extra careful particularly with the dark color. There are a couple of obvious splits in the first sock but…. it’s my first ‘real’ sock so additional practise will probably help that. I managed not to get any ladders but there is one ‘hole’ in the gusset area – again the light issue – but pretty sure I can fix it. My knitting tends to be pretty tight so I’m working on size 3 dpns but next pair will try going down to 2 circular. That will definitely give a very tight sock but that’s more user friendly – right? I may even make him tube socks with it as that’s what he normally wears. I’m trying to find the right purple/black colorway to start TJ’s funky socks. Lorna’s Laces black purl looks good but might possibly go with something more purple and less grey going into black. still trying to visualize how they will knit up into a fun, funky, lacey pair of socks.